Ye jo Des hai tera song lyrics from movie Swadesh movie, featuring Shahrukh Khan and Gayatri Joshi in the hub. 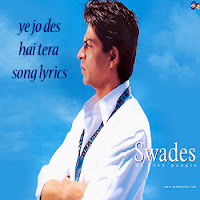 A.R.Rehman has given the music for Ye jo Des hai tera song. This patriotic song was written by Javed Akhtar. Swadesh was directed by Ashutosh Gowariker.